Heat 1 tablespoon of the oil in a large skillet and cook the chicken. Remove from the skillet and carve into thin slices. Cook the pasta as per the package directions. Drain the water when cooked. Add the remaining oil to the skillet. Add the flour and garlic and cook for a couple of minutes until the garlic has browned. Add the milk and broth and stir the mix well with a whisk. Bring to a simmer and cook for about 2 minutes until thickened. Add the cheese and stir until it has melted. Season with salt and pepper to taste and add the spinach. 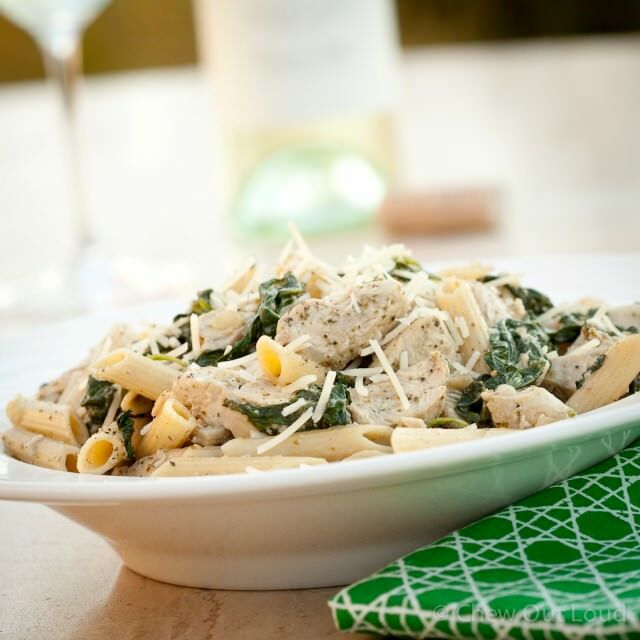 Once the spinach has wilted, add the pasta and chicken.